Passenger: Rob Winspear; Others: Rick McAuley, David Williams, Gareth Little, Ben Molloy, Carl Pugh. Family Connections: George Moore (Son). 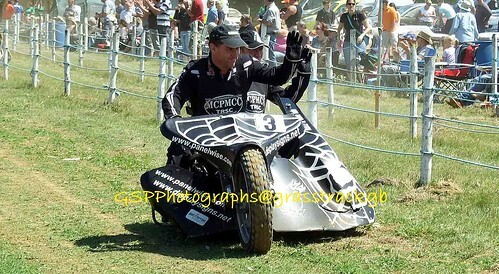 Sidecar Speedway World Championship: Third 2010, Other Appearances: 2005, 2006, 2007, 2008, 2009. European Sidecar Bonanza: Second 2005. British Sidecar Speedway Championship: Second 2008, Third 2003. Track Racing Championship: Third 2012. North of England Speedway Championship: Second 2001. 2015: Second Roden; 2014: Second Peterborough (ss); 2012: Second Peterborough (TRC2) x2, Third Peterborough (ss); 2011: Second Peterborough (ss); 2008: First Reading (ss), Second Plymouth (ss), Swindon (ss), Third Isle of Wight (ss) x2; 2007: Third Plymouth (ss); 2006: Second Isle of Wight (ss).